One of our favorite ways to spend a Saturday morning is getting lost in antique shops. Many years ago, J's grandparents used to own an antique store so he grew up surrounded by antique furniture and vintage pieces his entire life. Like most people, I grew up around them and could appreciate antiques, but never really knew the time period in which things were from or the significance behind them. When J and I met and got married shortly after (at 20 and 21) we didn't have a lot of money, so most of our furniture at the time was hand-me-downs from family. However, we were SO happy with what we had and it was then that I became obsessed with blending vintage pieces with our every day decor. Actually, the bed + dresser in our guest bedroom (these photos are from our old house) is from an old barn we rummaged through one day and sanded + stained once we got it home. It was made in the early 1920's and we're absolutely obsessed with it! Aside from furniture, here are a few (fairly) inexpensive things you can be on the lookout for while antiquing that will instantly make your space feel cozy and inviting! 1. Vintage Dough Bowls - This is one of my newest obsessions! I found this bowl while antiquing last week and immediately grabbed it. Mine is from the early 1800's which just makes my whole life. The hands that have touched this bowl, the dough that has been made in it, and the stories it could tell seriously amaze me. I'm using this one in my kitchen for fresh produce currently, but of course we will put it to good use if we're ever making homemade bread. I also love the longer ones and want one of those next! They're so perfect for bathroom storage to hold linens, at the foot of the bed resting on a bench, etc. 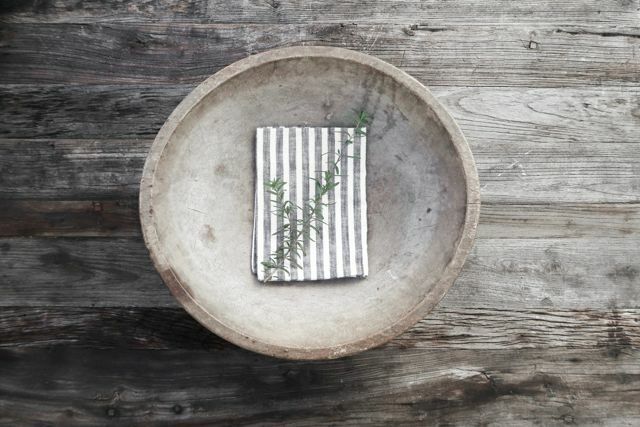 The possibilities are endless and the amount of character these vintage bowls add to your space is like nothing else. Dough bowls typically cost around $50-$150, depending on their size and age. Mine is a little on the larger size, so it was around $145, but worth every penny for this gem! 2. Vintage Bottles as Vases - this is one of my favorite (and cheapest) ways to add a few vintage pieces to a centerpiece. Typically, vintage bottles range anywhere from $4-$20, with the exception of novelty collectors items. (I think these two I picked up from an antique shop were $6 and $9. 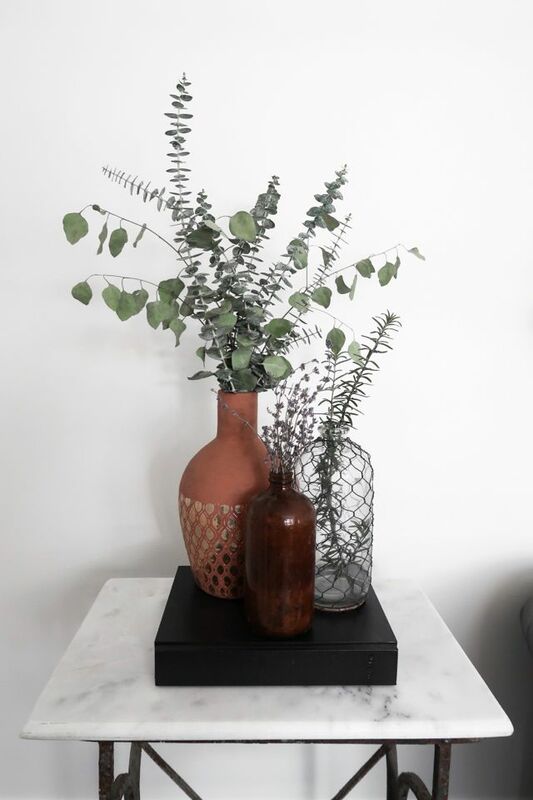 The terra-cotta vase is from Anthro and on sale, here.) Between vintage bottles, jars, and medicine bottles, you can have quite the collection for not a lot of investment. These look great in pairs, especially on exposed shelves, window seals, front porches, or coffee tables. 3. Vintage Pillows - Without a doubt, I need to go to pillow rehab. I have such a pillow obsession, it's not even funny. When we moved our things into storage last year, we had EIGHT trash bags full of pillows. Hello, my name is Megan and I have a problem. But seriously, I love adding texture + patterns to a room simply by pulling out + fluffing a few pillows. My favorite vintage pillows to find are ticking (these can even be new, but have an old, vintage vibe to them) and grain sack. This number, grain sack pillow that I found on etsy a couple of years ago was an actual grain sack from the 1940's. I have no idea what the sack was used for, but I love how old it is. Depending on how old the pillow/grain sack cover is, the prices can vary, but this specific one was around $40. I paired it with this cozy pillow I just picked up from Anthro (see, problem!) 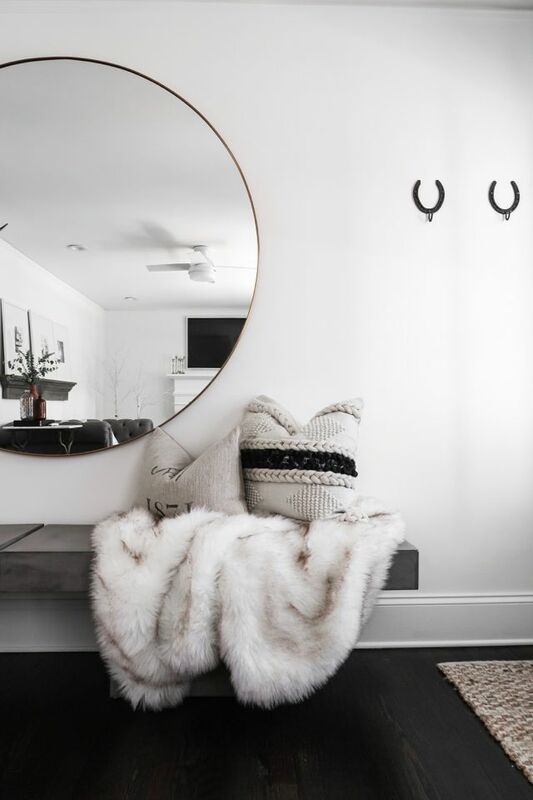 for the benches in our entry way and they're the perfect pair! 4. Vintage Milk Glass - For me, milk glass is hit or miss, but when it's good - it's GOOD. A lot of the milk glass you see in antique shops or on etsy looks super cheesy and not even old, just tacky. But, my favorite is the hobnail! My in-laws just got me this set for Christmas (it also has a matching pitcher) and we love it. Some milk glass is very expensive and I'm not totally sure why, but your typical set or serving piece is going to be in the $20-$40 range. 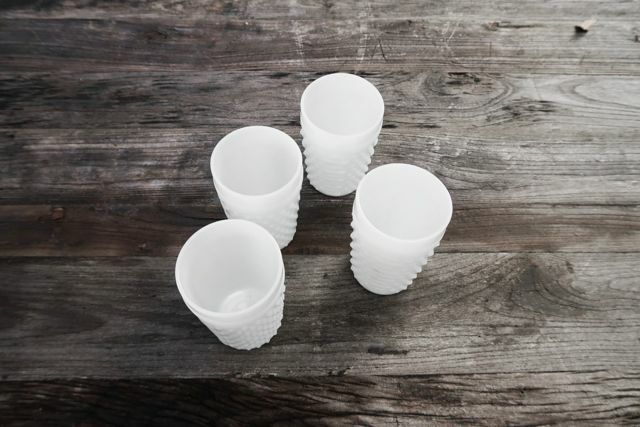 The small glasses are perfect for morning juice or milk and add so much character to a tablescape. We also have a few milk glass bowls + plates that are so pretty to incorporate with your china when hosting! 5. Vintage Cutting Boards - Can't get enough. That's all I have to say about these. Really though, I could rummage through crates of these old cutting boards for days! Just like the dough bowls, they have so much character. I love finding them on etsy from France, simply because I imagine they're from an amazing french bakery where all my bread and butter dreams would come true. (Yet another problem of mine.) These boards can range anywhere from $50-$250, depending on their size and age. Typically, I use these more for kitchen decor than functional use, but I do have a couple that we'll use every so often. Usually, I think they're perfect the way they are and I like to leave them that way! 6. 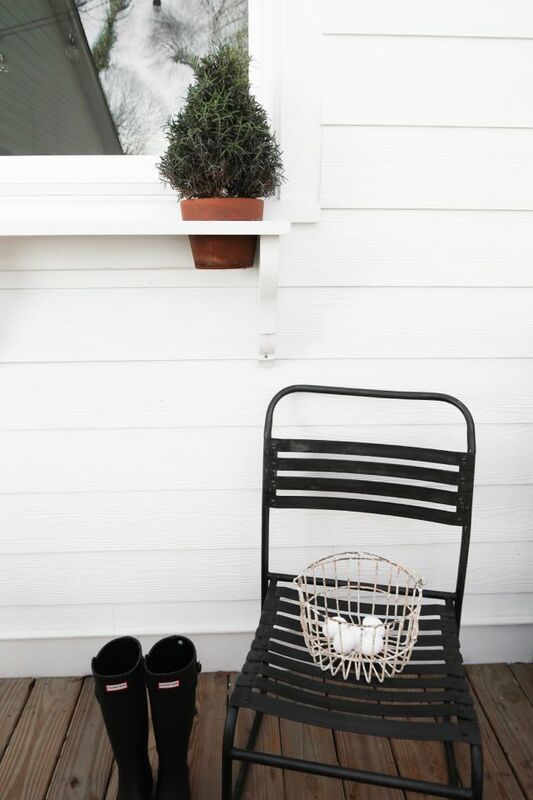 Vintage Baskets - Since our chickens are coming later this week (PAUSE, if you don't know this story - J has talked me into getting 4 chickens for our backyard. I've been talking about it on instastories, but we have a decent size space in-between our privacy fence and where our backyard ends, so we have a coop and everything set up back there. As much as I hesitated to finally say yes, I'm actually VERY excited about them and can't wait for them to arrive on Thursday!) I'll be using vintage egg baskets like this quite often. We should have anywhere from 2-4 eggs a day while our hens are laying and I can't wait to collect them from day to day in this cute, little basket! I even have an egg stamp on order that says 'the lovely cottage' - LOSER, I know. We also have a vintage oyster basket that I absolutely love. (I totally forgot to snap a photo of it, but I'll get one for you soon!) I ordered it off of Etsy a year or so ago and it holds extra pillows in our bedroom (back to the pillow problem). The egg baskets range anywhere from $10-$25 (I think mine was $12?) and the oyster baskets are a bit more. I paid a pretty penny, again, because I wanted it to be from France (french oysters just sound more amazing), and I believe it was around $140. The best part is, no two are the same and they're pieces you'll have + love for years to come! I promise, adding a couple or all of these vintage pieces to your home will add so much warmth + character to your space! 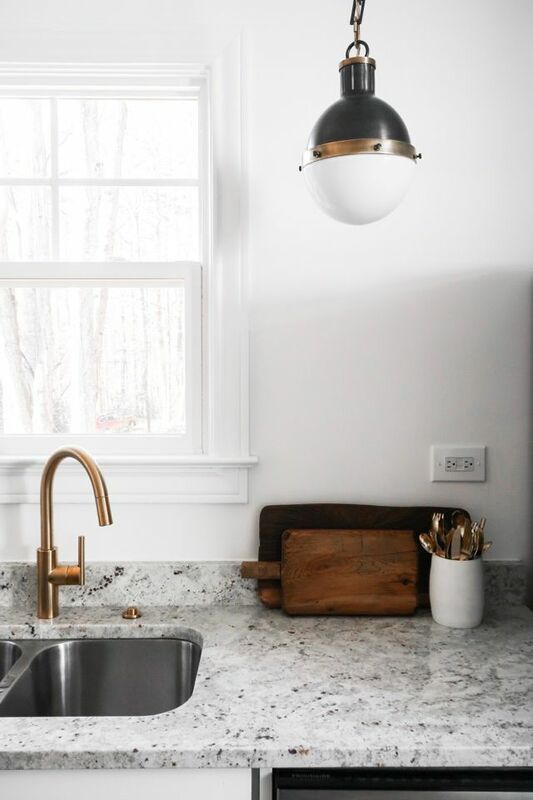 If you love home decor posts like this one, let me know in the comments below or by DM'ing/emailing me. I have so many vintage things around @thelovelycottage that we love and I could make this into multiple posts or a series! You are NOT a loser for ordering an egg stamp! Even if all you ever use it for is to stamp the eggs that you and J use, how happy will your heart be to open your fridge, grab the container, and see "the lovely cottage" on a perfectly imperfect, FRESHLY laid egg? It's totally worth it, and you are not a loser for that in the slightest! You have to be one of the classiest, most chic women I know, and I can't wait to see what else is in store for your for 2018! Where is the front door rug from? And the horse shoe hooks? BEAUTIFUL! I absolutely love this!! You have to train us on searching Etsy! I have such a hard time finding what I am looking for.